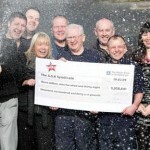 SSI UK electrical site workers came painfully close to winning the Euro Lottery jackpot, after their syndicate correctly predicted the five regular numbers but just one of the two lucky stars. 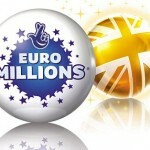 The 30 winners will equally divide an amount of £288,000, which means that each of them will pocket £9,625. Although they are slightly disappointed by the fact that they were so close to winning the jackpot worth 38 million, this money will serve as an excellent consolation prize and prove useful, now that the winter holidays are approaching. The SSI UK electrical workers decided to play as a syndicate instead of purchasing tickets individually and it was Ted Phoenix who set up the group in the first place. He was also the one who bought the ticket and patiently waited for Friday’s drawing, hopeful that this time he and his 29 colleagues will finally enjoy some return on investment. After the initial enthusiasm dwindled, Ted put the ticket in the same place where he usually places the tickets bought for the syndicate and completely forgot about it. Several days later, as he was preparing to return to work he remembered about the ticket and decided to check out the numbers. Much to his surprise, he realized that his lottery ticket matched the five normal numbers which were 5, 11, 35, 38 and 45. Had he matched both lucky stars, each of the syndicate members would’ve pocketed an amount exceeding £1 million as the Euro Lottery jackpot stood at a massive £38 million. 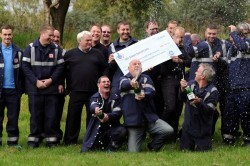 It would’ve been a great reward for the syndicate who has recently celebrated one year of existence, but even so the steelworkers are over the moon for winning the second-tier prize. 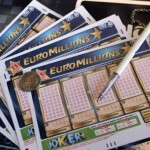 Whenever the Euro Lottery jackpot or other major lottery prize for what matters is split among several people, the media tries to find out what the lucky winners plan on doing with the money. In this case, it is virtually impossible to know exactly what the thirty steelworkers will spend their money on, as everyone has a different idea of how to celebrate. Nevertheless, most of them have expressed their intention of taking a vacation and Spain appears to be the most popular destination. It is easy to understand why the winners would like to trade the cold British weather for the sunny shores of Spain, but they will need to reach some sort of agreement. It is hard to believe that the employer will allow so many workers to go on vacation at the same time, which means that compromises will be made. Obviously, this should come easy for these happy people who have already worked together for a common good, both as colleagues and members of the same lottery syndicate. Check out the Coworkers choose to share lottery prize with a new colleague as well.